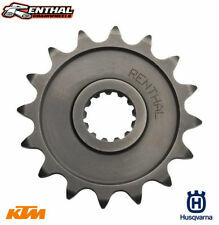 Renthal Front Gearbox Sprocket. -2 Teeth and Standard Chain Pitch. If you do not see what you require, ask us! Chain size 530 pitch. (sorry picture of a similar sprocket). 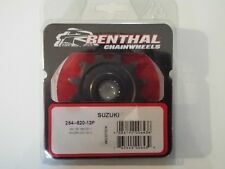 Renthal 17 T Front Sprocket 500U-520-17 to fit Suzuki GSXR 1000 L7 2017. Renthal Front Gearbox Sprocket. Standard number of teeth and 520 Chain Pitch. If you do not see what you require, ask us! A and R Racing Services. Renthal Front Gearbox Sprocket. 1 tooth smaller than standard sprocket size for better acceleration. Standard Chain Pitch. A and R Racing Services. If you do not see what you require, ask us! Aprilia Tuono V4R 11-15 Renthal Gearbox Sprocket 16T 525 New. Honda CBR600 01-15 13T 520 Front Race Gearbox Sprocket. Renthal Ultralight New. RENTHAL 305-520-16 APRILIA / BMW FRONT SPROKET. Renthal 289-530-17 Front Sprocket (17 T ). Chain size 530 pitch. (sorry picture shows 16 tooth).